A fascinating Pathé news film from 1968 shows Basutoland, the country of my birth, as I barely remember it. A farmer bends over his plough which is drawn by two pairs of oxen. Another farmer appears to be driving a tractor, but, as the camera turns, it becomes clear that it has broken down and is also being drawn by a team of oxen. Seven-year-old herd-boys lead flocks of sturdy sheep ever higher into the mountains in their desperate search for pasture. Woven mohair is one of Lesotho’s few exports, but more significant are the 100,000 men who migrate annually to neighbouring South Africa to work in the gold mines. The alternative is starvation, and their wages are ‘crucial to the country’s revenue’. However, Roman Catholic missionaries have long ago brought schools and hospitals, and deep faith, to Basutoland, which has the highest literacy rate in Africa. A ‘flying doctor’ service operates in the remoter parts. Most Basutos get about on horseback. The young King, Moshoeshoe II, himself daily ‘rides among his people’. The most fascinating scenes are of Maseru, the capital town, which boasted the only metalled road in the entire country – the ‘Kingsway’, built for the visit of King George VI in 1948. The commentator describes Maseru as ‘something of a shanty town’, and there are lingering shots of ‘Main Street’, a dusty thoroughfare lined by thatched huts, stalls with cardboard awnings and a scattering of glass-fronted modern buildings in the local sandstone. (One that I particularly remember was a shop with a thatched roof in the shape of a Basuto hat.) It seems a sleepy place, like something out of the American Wild West, with lone horsemen ambling by, a procession of pack-mules and women wrapped in distinctive Basuto blankets carrying loads on their heads. Almost everything in Maseru has had to be imported, from the oranges sold in the market to the barber’s clippers and the cardboard that he uses for his awning. 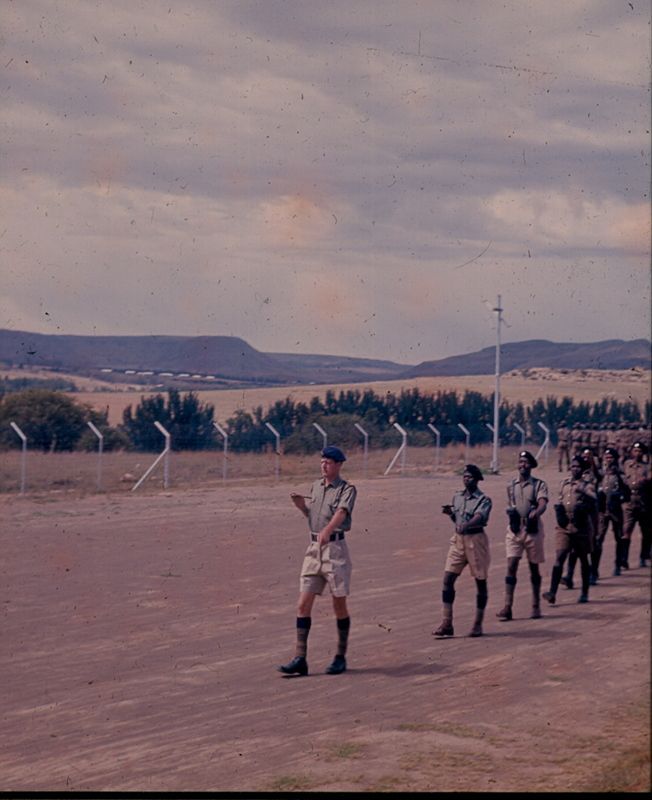 It is reassuring to see ‘the precision drill of their new police recruits’ at the Lesotho Mounted Police Depot in Maseru, knowing that the high standards set by my father have been maintained. 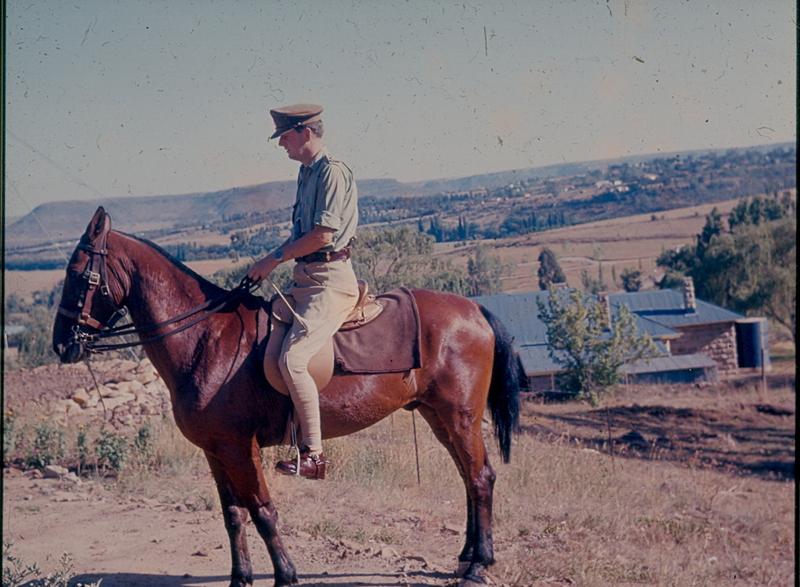 As his last job in Basutoland, my father co-raised the paramilitary ‘Police Mobile Unit’ of the Basutoland Mounted Police, which was to be the nucleus of the defence and security force of Lesotho. He maintained that his recruits were addicted to drill and enjoyed practising it in their spare time. ‘Chris Willoughby had a smart automatic pistol, a 9mm Beretta I think it was, and I took my rickety Browning, and off we went shooting at beer cans in a suitably secluded bit of countryside up near the race course. It was in this improbable, timeless landscape that I roamed barefoot during my early years. I have only vague memories of the place, one of the strongest being of our last few days in Maseru. Having packed up all our belongings for shipment back to England, we took up residence in the Lancer’s Inn on Kingsway, which passed for Maseru’s smartest hotel. It was – and is – more of a ‘motel’, with guest accommodation in a jumble of single-storey blocks at angles to the main building. While there, my elder brother and I encountered a permanent resident of the Lancer’s, a retired trader and old South Africa hand by the name of Bacon, who was reputedly 99 years old. He would therefore have been born in 1867, and would have been in his thirties at the time of the Boer War. Though I do not recall him regaling me with stories of that time, I suspect that not many people can precisely identify the oldest person they have ever known. My mother recalls that, during our stay at the Lancer’s, there was a commotion one evening as a dead body was stretchered out with a sheet over its head. She frantically tried to shield our impressionable eyes from the grisly scene. It seems we had encountered this living relic in the nick of time! When I was eighteen months old, I had been taken to Vicksburg in the Orange Free State for a minor operation, and had been put in a ward full of adult men. 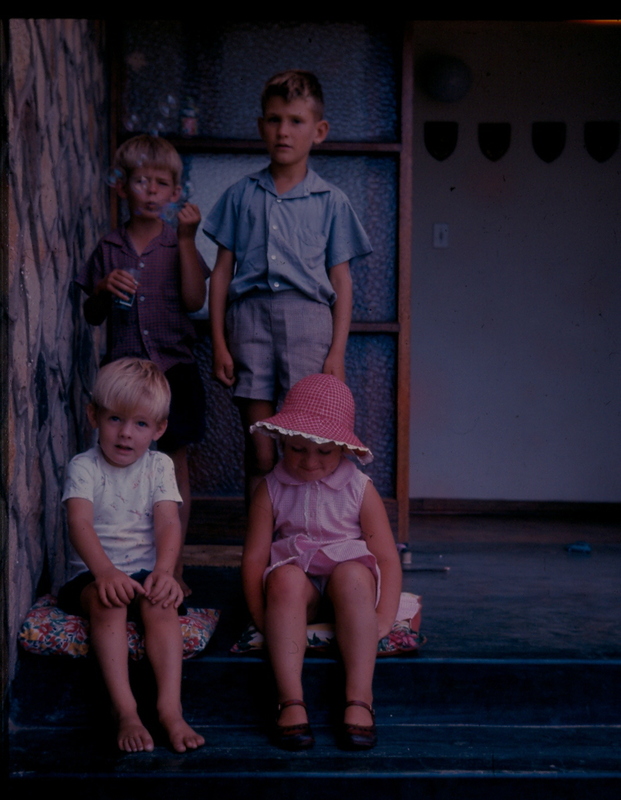 They were Afrikaaners and spoke no English. My mother would find me at visiting times being dandled on the knees of these old Boers who were attempting to comfort me. It seems very likely that there would have been veterans of the Boer War among them. My own great-grandfather (born in 1869), had also served in the war, on the opposing side, but of course I never knew him. The 1968 Pathé film about newly-independent Lesotho can be viewed at http://www.britishpathe.com/video/emergent-africa/query/maseru. Pictures of the Lancer’s Inn are at http://www.lancersinn.co.ls/index_files/Page390.htm.